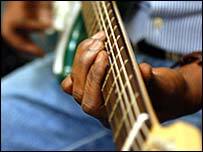 Live music is being used to try to prevent prison inmates from re-offending. So how did pop, jazz and reggae become weapons to fight crime? 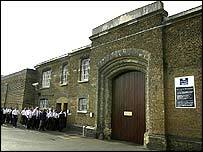 As a venue for live music, the chapel at Brixton prison must be one of the strangest. The Victorian gothic church, on a drab south London afternoon, looks out on a courtyard lined with razor wire, heavy-duty security gates and metal fences. But inside there's music, with songs written by inmates and performed with a yearning that must have matched any of the prayers offered up in this bleak place. 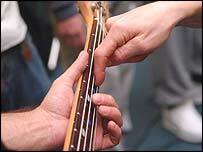 This is the "Music in Prisons" project, in which musicians work with inmates on writing and playing their songs. For the performance in Brixton, the atmosphere is upbeat - but singing a song about a long-lost girlfriend has a sharper edge when you're stuck inside a prison cell. And the Brixton chapel show is full of contrasts - there's a guy with biceps the size of tree trunks standing in front of an altar statue of a Madonna and child, and for one of the songs, the backing singer is a prison officer in uniform, keys jangling in time to the music. By the end of the show - a soulful mixture of pop, jazz, rap, reggae and poetry - there are people dancing in the aisles. The songs are about lost love, loneliness, spirituality, street life and politics. The performers afterwards are exuberant with the energy of playing. There's a singer proud to have overcome his nerves at his first public performance, another - a musician before entering prison - talks about the sheer sense of release and self-expression in being able to play again. But should prisoners be enjoying themselves like this? Shouldn't the help be going towards their victims? Can music really rehabilitate criminals? John Podmore, governor of Brixton prison, tackles this head on - saying there were "no treats for cheats" in his establishment. "In this prison, if it's not about reducing re-offending, I don't do it," he says. And the music project is a form of training that is accessible and really works with inmates, he says. "It's not about putting on a school play and everyone feeling good about it," says Mr Podmore. Instead it's about finding a way to unlock people who are used to a life of selfishness and unused to personal responsibility. "In prison, you can get by being selfish, looking after yourself and no one else, in fact it's almost inherent in surviving in prison. But that doesn't help when people have to go out and become part of communities," says Mr Podmore. The music project forces inmates to work together, to learn from musicians, to see positive role models and to think about what they want to say in their songs. And he says it's about making some deeply troubled individuals re-engage with other people and think about how they've ended up behind bars in the first place. "If someone is feeling suicidal, how do you deal with them? You don't just fill them with drugs and take away their shoe laces, you give them a reason to live. Let's give them something positive to think about," he says. 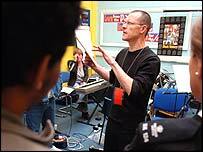 Mr Podmore also has a no-nonsense approach to the idea that prisons shouldn't be about making music. "People who say these are holiday camps don't know what they're talking about. These are not pleasant places to be." And he says these inmates will, sooner or later, be walking free - and the big question for the community outside is what sort of people these ex-prisoners are going to have become? At present, most inmates re-offend once they leave jail. The challenge is to find a way to intervene in this cycle - and Mr Podmore says projects such as this can push convicts towards learning different ways of behaving. But he's also blunt about the scale of the problems that arrive with each inmate - a large majority will be hard drug users - and will still be there waiting for them at the gates when they leave. "Before these guys are released, we want to take out the drugs and the crime and replace them with more constructive things - maybe music, but also a job and a home." Sara Lee, a musician who is the project's co-ordinator, says her work challenges prisoners who might never have played music before - and gives them a "chance to surprise themselves by doing something they had never expected to be able to do". Inmates can be too scared to play sometimes, she says, but when they succeed in writing, rehearsing and playing their own songs, in front of a prison audience, it can give them confidence and a sense of purpose. "People will come out of prison in the end - and it's far better that there has been positive work to give them a new set of choices, rather than leaving them there and not assisting them to change and develop," she says. The project is run by the Irene Taylor Trust, set up in memory of Lady Taylor of Gosforth, the wife of Lord Taylor, the late Lord Chief Justice. 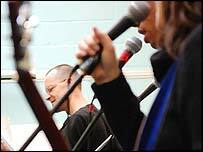 Music in Prisons has run more than 80 projects across the country - and its website hosts its own top 10 chart for prison bands (currently headed by a group from HMP the Mount in Hertfordshire, followed by bands from Pentonville and Belmarsh, with Rampton musicians at number 10). And next year it plans to develop "throughcare" projects in Brixton and Holloway prisons, working with inmates approaching their release date - using former participants as mentors, in a scheme to be run with the Guildhall School of Music and Drama. One of those former participants, released last year and now singing in clubs in Yorkshire, says she benefited from the chance to get involved in music while in prison, on a project producing a songbook for children. "They don't patronise you. They work with you, in a way that's supportive. It was a release and a way of expressing yourself. When you're thinking about your own children, and you can't see them, you put everything into it."